This fascinating model of an average European adult skull can be disassembled into 22 single bones. During development of this model one of the main targets was to make the model easy to assemble and dismantle. Stable parts with convenient magnet connections make handling of the product a child‘s play. The detailed bones do not need any complicated pins to be stuck into holes, they almost slide into position, guided by realistic bone sutures and held by strong magnets. The perfect tool for Osteopaths. Supplied with users guide in English and German as well as a CD with Key card document in Latin, German, English, French, Spanish, Portuguese, Italian, Polish, Russian, Arabic, Korean and Japanese. Didactic version. This version is perfect for visual distinction of the single bones. The bones are produced in different colors, commonly used in anatomy, geminate bones do have identical color. High Quality Specimen Made in Germany. 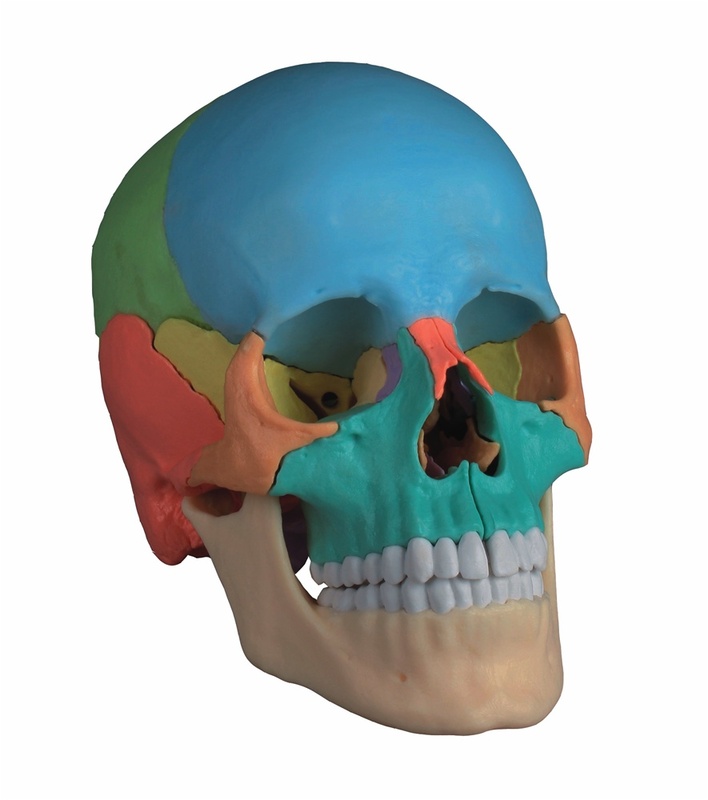 This skull has helped me improve my skills in applying osteopathic cranial manipulation treatments. It is an excellent skull, very accurate for a plastic skull in terms of suture and bone shape. Colors helpful, and magnets make it easy to disassemble and reassemble. Palatine bone does not extend up into orbit, a minor detail. This is an excellent teaching tool. Others in my program are considering acquiring their own. I am a Massage Therapist, also practicing Craniosacral Therapy(CST) and preparing for an advanced class in CST. 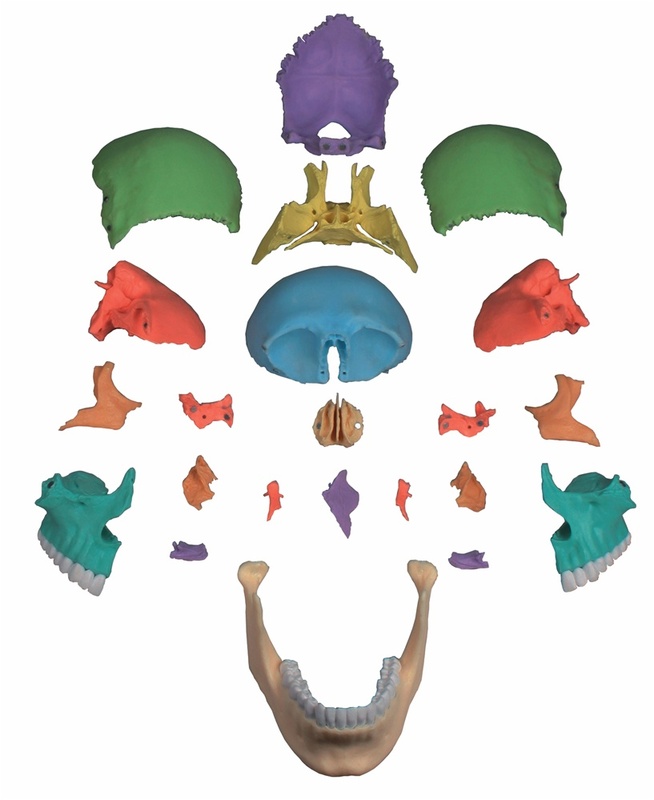 Using this tool to accompany studying and practice, it is perfect for observing the size, shape, and location of all the bones affected by CST, on their own and in relation to each other. This is also a great tool for educating clients in what is accessed and affected by their treatments. There are some small parts which are easy to lose, but they do give you a few replacements. If you lose or damage one of the larger pieces, you must purchase a replacement on your own. Highly professional model. [...] I received the non-magnetic model from another company as a gift, but I returned it for this version - infinitely worth the slight hassle and fees! It comes with replacements for the smaller bones that do not have magnets. The other model did not, or perhaps it was the company that sent it.